Do you view art as just messy playtime for kids? Or do you realize it’s so much more than that? Art can be good for kids in many ways. While it’s important for a child to learn science, math, and reading, art is also key to their development. At home, it’s a great time to connect with your child and encourage their creativity. In school, it’s a way for them to communicate and build confidence. With art education on the decline in schools all around the world, it’s up to us as the parents to inspire, introduce and cultivate the little Piccaso in each child. Let’s take a look at what art is, its benefits, and how you can help get your kids involved. Is Art Education on the Decline? Four times more likely to take part in a math or science fair. Three times more likely to have good school attendance and win an award for it. Four times more likely to be recognized and acknowledged for academic achievements. Three times more likely to stand for and be elected to class office. Likely to have higher SAT scores. More likely to gain employment after school due to their creativity. Despite these facts, many educators feel not enough emphasis is being placed on art in schools. In fact, 66 percent of public school teachers feel that arts are being overtaken by the need for math or language arts. There has also been a steady decline in the availability of arts education for African Americans and Hispanic Americans. Between 1982 and 2008, it dropped from 47–51 percent to 26–28 percent (source). A more recent report, The Nation’s Report Card, carried out by the National Center for Education Statistics, was compiled in 2017. 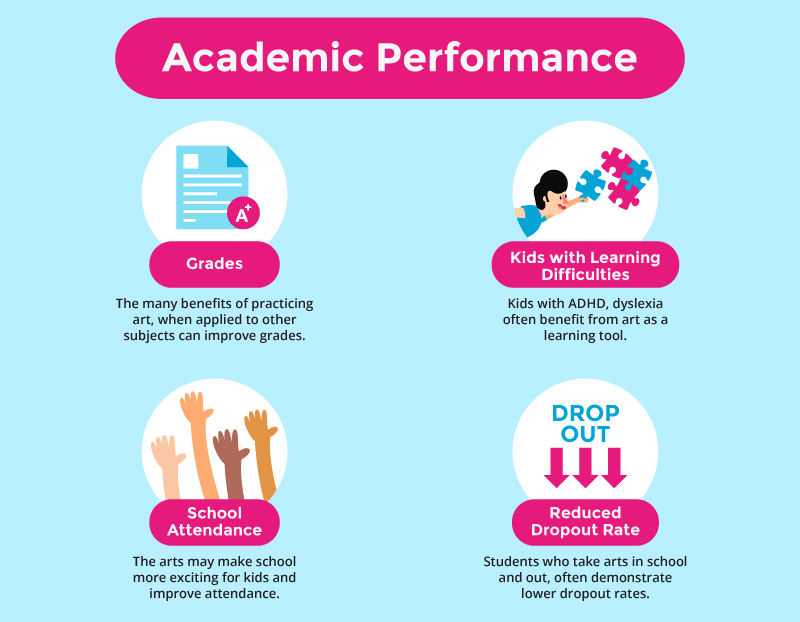 This showed that students who take music lessons or art classes, go to the theater, or visit museums, achieve higher scores in their tests (source). These facts and figures represent an overwhelming reason for getting our kids interested in creative pastimes at an early age. This is where you as a mom or dad come in. If these facilities are not being offered on the scale they should be in school, then you can help. Start by fostering your child’s artistic appreciation at home. This can be done as simply as encouraging fingerpainting in toddlers. As they grow, you can introduce them to other creative activities. Art is an all-encompassing word for many different creative outlets. It’s not just the paintings you see hanging in the Smithsonian, Metropolitan Museum of Art, or any of the other art galleries in the world. It’s also theater, music, dance, performing arts, literature, film, and media, to name a few. It’s diverse and includes the many ways that we create things and express ourselves. It’s also used to describe the way we appreciate the aesthetics of the things other people create or the performances they give. Art can be classified as fine/creative art or applied art. Confusing? Let’s explain each of these further. Fine art tends to be the category applied when someone uses a skill to express their creativity or engage their audience visually. Creative art generally conveys a mood or message, or some kind of symbolism, and aims to stimulate the senses in some way. These terms are usually applied to paintings or sculptures, for instance (source). Applied art refers to design and crafts, such as making jewelry or working with porcelain or other materials. It would also include things like embroidery, knitting, and crochet, among others (source). So, is there a difference between arts and crafts? It would appear the answer to that is yes. Arts are unstructured and stem from an expression of feelings or emotions in a visual form. 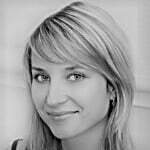 They are based on creative merit and only serve an aesthetic purpose. They emphasize ideas, feelings, and visual qualities. Crafts involve the creation of tangible objects using your brain and your hands. They are based on learned skills and technique, using the correct tools and materials. They serve a decorative or functional purpose (source). While we have established there are different types of art, we will concentrate on the benefits of fine/visual arts and crafts for kids. It’s worth pointing out art is beneficial for everyone. Historically, art has depicted how different civilizations lived and what their cultures and traditions were (source). Art can also be used as therapy. It can help people overcome the effects of illnesses, or it may calm a troubled mind (source). It can help people earn a living, with skills like architecture and commercial or advertising art. Theater and music bring people together socially, and can also be a form of personal expression. So, what are the ways art can benefit our kids? Let’s take a look at them. Gross motor skills: These are the movements of the large muscles of the arms, legs, and torso, which aid balance and coordinate with our nervous system. 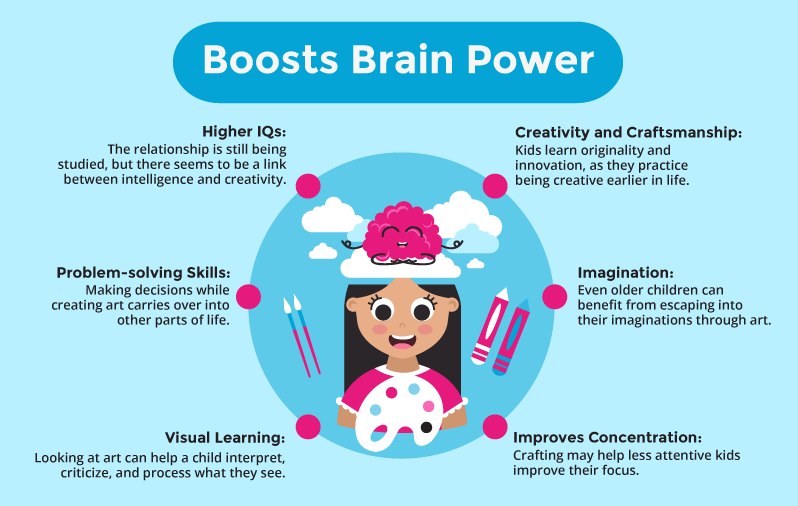 Activities such as painting, drawing, crafts, and scribbling encourage the connections between the brain and these muscles. Try activities like murals, which make them stretch, or modeling, which involves working with clay (source). Fine motor skills: These involve the smaller muscles in the fingers and hands. Exercising these muscles helps with writing, tying shoelaces, turning the pages of a book, using scissors, and so much more. Try activities like drawing — even if it’s just scribbling, cutting with scissors, finger painting for little ones, or origami for older kids (source). Hand-eye coordination: When drawing, painting, or doing any other intricate task, it’s our eyes that guide our hands to do our bidding (source). Playing with different shapes, tracing, connecting the dots, and even coloring within lines, help hand-eye coordination (source). Different types of art can help our kids develop their vocabulary and communication skills. Language skills: Art gives kids an opportunity to talk about colors, shapes, and what they are doing. They can describe what they have painted, scribbled, or created, helping them to communicate and expand their vocabulary. Art appreciation can help younger kids describe what they see, learning to put their thoughts into words (source). Comprehension skills: Arts and crafts can help kids understand the world around them in many ways. Reading directions for how things are done, or working out how to do something, can aid their comprehension. Play a game with young kids, like Pictionary, where they draw a picture to describe a word, or use computer graphics with older kids (source). Literacy: Art can help develop writing, reading, listening, and speaking skills, making a child more literate. Encourage them to look at illustrations and match them to the text of a story, or express themselves through dance, music, or drama (source). Higher IQ: There might be a relationship between creativity and higher IQs. That being said, this relationship is still under investigation (source). Improve problem-solving and critical thinking skills: Give two kids the same challenge and see how they will each approach it differently. It could be making something from an array of items, like rubber bands, paper towel tubes, cotton balls, or paper clips. They will learn to think constructively about what they are doing and work out ways to help them achieve their goal (source). Visual learning: Looking at art can help a child interpret, criticize, and process what they see. These skills can be applied to many other aspects of their lives. A child who is a visual learner will likely enjoy picture books or reading, and will often want to see how something is done before they attempt it themselves (source). Improve creativity and individual craftsmanship: Kids will learn to be original and innovative when using art as a medium from a young age. They will be able to express themselves and will work out which type of art they prefer (source). Imagination: Art in all its forms encourages a child to use their imagination. Escaping reality and entering the world they create can help with their well-being and mental health. Looking at and describing art can also promote a child’s imagination as they create their own stories about what they see (source). Improve concentration: Arts and crafts often lead to an end product. Following steps in sequence to complete a drawing or craft project can help a child focus and concentrate. This is especially the case if it’s something that interests them or is new to them (source). Using arts and crafts can help develop an awareness in children of the different traditions and cultures around the world. It can help them understand that not everyone has the same beliefs, and is a fun way to show that we are all equal. It will help them understand and accept those who are different from them. It can also be a useful tool in preventing bullying. When a child knows that someone has different rituals, they won’t see it as outside the norm, and will be more likely to accept them. You could help them draw an African tribal mask or make a Native American dreamcatcher. While doing this, explain the traditions behind these objects, and why they’re made (source). 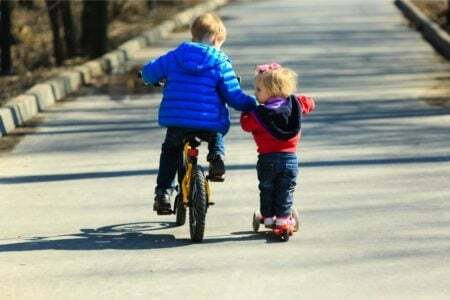 Teamwork and collaboration: Whether it’s creating or appreciating art forms, it gives kids a chance to connect with their peers or adults who might not share the same interests. Talking about art or working together to create something provides common ground. Ability to follow directions: Crafts often have specific instructions to complete a project. This could be following a knitting pattern, stitching a stuffed toy, or making clay figures. Being able to follow directions is a useful skill all through life. 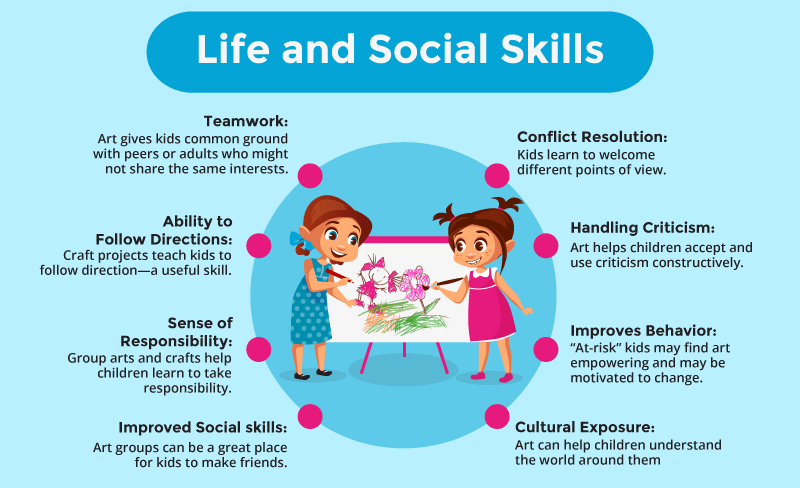 Improved social skills: Joining an art group, or even just collaborating on an art project in school, helps kids communicate. It’s also a great way for them to expand their social circle and make new friends. A sense of responsibility: Participating in arts or crafts as part of a group can help give kids a sense of responsibility. They might have their own piece of the project to look after and know that they are crucial to its successful completion. Ability to resolve conflicts: Art can help kids understand there is more than one way of looking at something. It will help them express points of view and work out solutions that are beneficial to everyone. Conflict can be seen as a chance to learn and grow (source). Handling criticism: Although there is no right or wrong with art, constructive criticism is a way that can help kids accept there is another point of view. This may be someone assessing their art, or them looking at the art created by others. Improving behavior: Participating in various arts, like music, drama, creative writing, and others, might help kids who are “at risk” to find motivation. 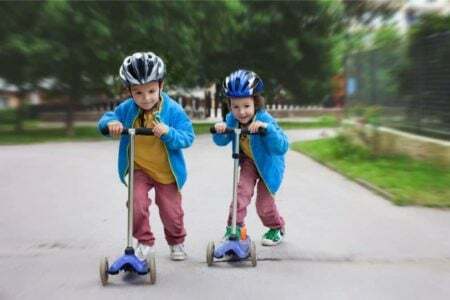 It could improve their behavior as they learn to express themselves in healthy, productive ways, and take pride in their accomplishments (source). There are conflicting schools of thought where art and academic performance are concerned. One thing that is agreed, though, is whether or not art improves academic performance, it still has a part to play in a child’s life. Influence on general school performance: Academic performance can be influenced by taking part in the arts. It doesn’t necessarily mean that art makes your child better at other subjects, like math and science. However, all the added benefits art provides can help a child achieve in other areas (source). Art can reach students with different learning styles: Kids with special needs, like ADHD, dyslexia, and sensory disorders, might not learn in the same way as other children when it comes to core subjects. With art, the field is leveled, as it’s subjective and doesn’t follow set rules and expectations. It can allow children with learning difficulties to match the performance of their peers, building self-esteem and confidence (source). Fosters regular school attendance: We mentioned some statistics earlier concerning the increased school attendance of kids who take part in arts. When kids have art as part of their curriculum, school becomes more fun to attend. Learning excites them more and they are less likely to be absent. Reduces school dropout rate: This is another statistic we touched on earlier. Students who take part in the arts, whether in school or outside, have a much lower dropout rate than those who don’t. In low socioeconomic groups, this can be five times lower. 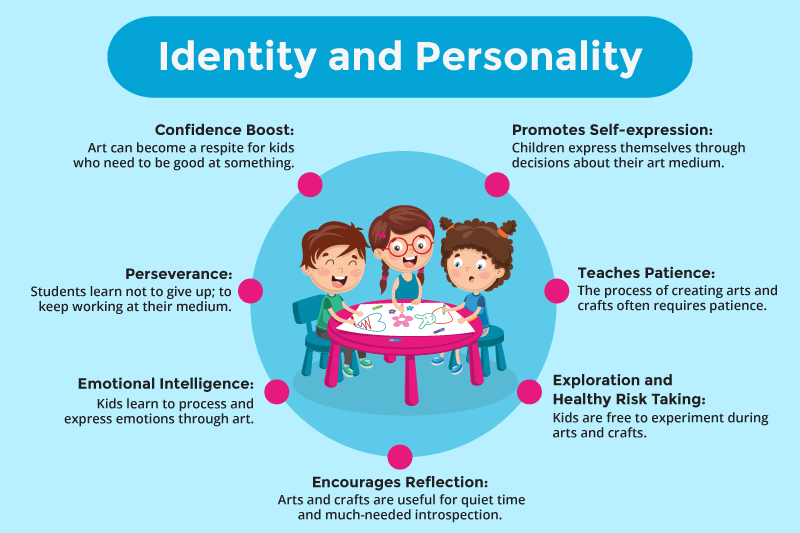 Art can have beneficial effects on a child’s personality and sense of identity. Confidence boosting: No doubt, you praise your child’s achievements and help them gain a sense of self-worth. Art, however, teaches them self-respect and can be a respite for kids who need to excel at something. Feedback from peers, and learning to accept as well as give criticism, helps build self-esteem (source). Teaches perseverance: Whether it’s visual art, music, dance, or theater, art can help a child stick to something and see it through to the end. Teaches patience: Waiting for things to happen can be challenging for kids. It could be something as simple as waiting for glue to dry before moving to the next stage of a craft. Learning to hold back teaches them the value of patience. 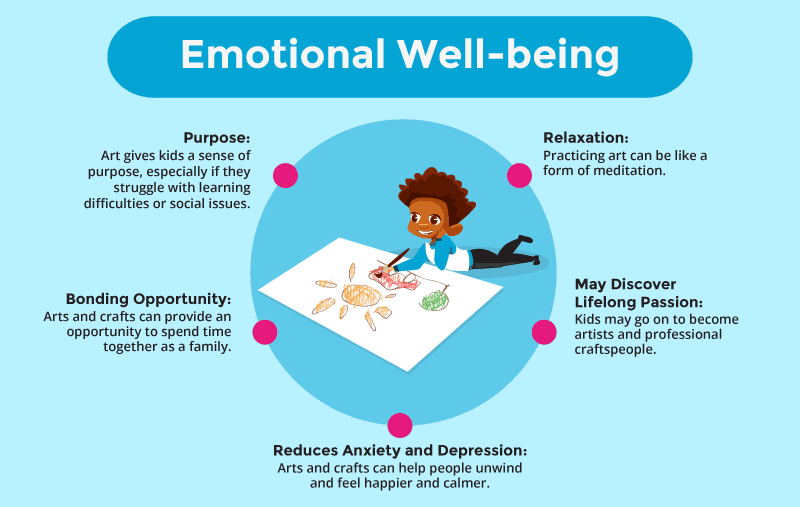 Emotional intelligence: The highs and lows that a kid experiences when creating can help them control their own emotions and be empathetic with others. It can also help them express their emotions and benefit their relationships with others (source). Encourages reflection and introspection: Life is busy, even for kids. There’s school, after-school clubs, sports, and more. Arts and crafts are a way of getting kids to have some quiet time and gives them a chance to think. Promotes self-expression: Art can give a kid an outlet to express themselves. Whether it’s choosing what color to use on a painting or which fabric to pick when crafting. 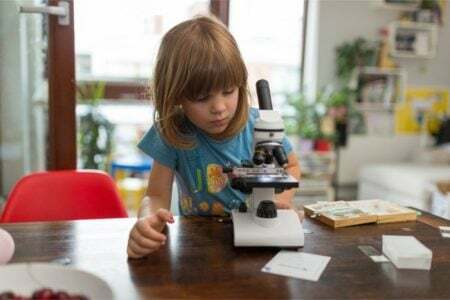 Allows for exploration and healthy risk-taking: Experimenting during arts and crafts is a great way for kids to learn what works and what doesn’t. Maybe they decided painting something a particular color didn’t work and will change it next time. Seeing as there’s no right or wrong, they learn from what they might see as mistakes. Art can benefit kids emotionally and contribute to making them feel good about themselves. Gives a sense of purpose: Practicing arts and crafts can make kids more enthusiastic about other aspects of their lives (source). We have already mentioned the positive effect it can have on kids with learning difficulties, social issues, or problems with self-esteem. Bonding opportunity: Not only do kids form friendships and connect with their peers through art, but they also bond with their family. Taking some time out with your kids while painting, crafting, or doing any other type of art, gives you valuable family time. Reduces stress, anxiety, and depression: Arts and crafts of all kinds can help people feel happier and calmer. Interestingly, it’s not just while they’re doing it either. The effects can last into the next day, so encourage your kids to learn a craft and do it after school. Relaxation: Taking time out to concentrate on nothing else apart from creating what’s in front of you can be a great way to relax. It can distract kids from the ups and downs of everyday life and is like a form of meditation (source). May discover a lifelong passion: Although it’s not always the case, many kids who love art go on to become professionals in one of the fields they choose. This could be music, dance, or visual arts and crafts. Now that you know what art can do for your child, it makes sense to get them involved. This can be done from a young age to get kids interested in and excited about art. It might just be some finger painting for a toddler which then progresses as they grow. Just remember taking part is what counts, not what the outcome will be. Your 6-year-old might be enthralled by the latest dance craze, but it doesn’t mean they will grow up to be a dancer. Maybe your 8-year-old loves piano lessons and singing, but they might not be the next John Legend. Introduce your child to the various arts. Take them to the theater, the ballet, museums, concerts, and exhibitions, and let them enjoy the experiences. There may be some things they don’t like, and that’s fine as well (source). Kids will often follow your lead and do as you do. Let them see you appreciating art in its various forms, whether it’s pointing out the merits of a painting, knitting them a scarf, or loving music. Take time out to complete arts and crafts projects with your kids. Even if you are not particularly artistic, it’s good for kids to see that it’s not all about getting something perfect. It will encourage them to try, even if they aren’t good at something. My partner has two left feet, but will still get up and dance; yes, embarrassing daddy dancing. I can’t draw to save my life but will sit down with paper and pencil and try. It’s the taking part that counts more than the outcome. Books with just pictures and no words are a great way to introduce kids to art. They can let their imagination run wild as they tell the story they see in the pictures. Lost for something to do during the holidays? Go visit an art gallery or a museum. You might even find there are some local craftsmen or women in your area that the kids can go and watch at work. If your budget allows, have some art in the home. 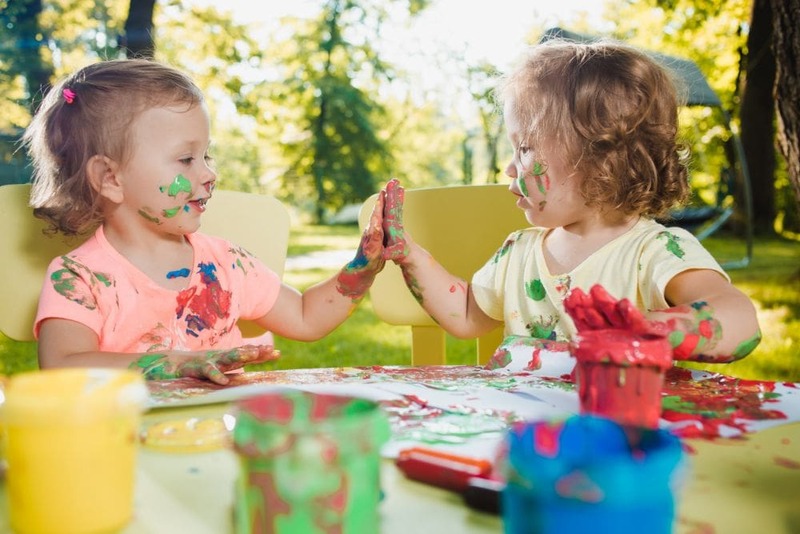 Letting a toddler loose with paint can be a messy experience, but think about the pleasure it gives them. If you’re prepared for the mess, it won’t come as such a shock. Lay down a ground sheet or drop cloth, or use newspaper to cover a table. Maybe, if the weather permits, you can use the backyard for painting time. Assigning a space where kids can let go and express themselves without fear of ruining your best rug or furniture is a good idea. They will love just smearing paint around with their hands or playing with Play-Doh. They won’t be bothered about what they’re creating, they will just enjoy the experience (source). Sometimes it’s hard not telling our kids what to do, but letting them decide what to draw or paint, and how to do it. We’ve mentioned there’s no right or wrong way to create art, so let them loose. If the kids decide they want to color outside the lines or mix one paint on top of another, let them. They might not be bothered about washing a brush between different colors and that’s fine too. After all, it’s their creation, not yours. Is it a bird? Is it a tree? Is it a car? These are not the sort of questions you want to ask your kids about their art. Keep your mind open and let your child tell you what they have created. Use phrases like “Tell me about your painting,” and be guided by what they say. Maybe you see something different in the scribbles they’ve made on the paper. Tell them about these and discuss it with them. This lets kids know you’re paying attention and are interested in their work. Even though you might not see what your child sees in their artwork, don’t be tempted to change it. Remember, it’s their vision, their creation, and there is no right or wrong interpretation or way of doing it. This is particularly important if you have a child who has learning difficulties or struggles at school. Correcting what they do will not foster a sense of achievement or boost their self-esteem and confidence. Be thoughtful when giving your kids feedback about their work. An off-the-cuff standard response, like “that’s nice,” will let your child know you aren’t interested. Take the time to engage with them and let them tell you their thoughts. Don’t be tempted to take over. Let your child know you’re there and ready and willing to help if they need it, but in their time and on their terms. Encourage your kids but don’t impose yourself on what they do. Having art supplies on-hand at home will encourage kids to replace screen-time with creative projects. This will help them entertain themselves as well as work independently. Just make sure you have the right materials for your child’s age and the means to correct their mistakes if needed. For example, if they are into pencil drawings, make sure you have an eraser. Also, make sure the materials they have are safe and age appropriate. Paint should be non-toxic and don’t let a young child play with sharp adult scissors — get kid-safe ones. Some of the art supplies you need can easily be found around the home. While you will need some basics, you don’t need to go out and spend a fortune. Here is a checklist of basic art supplies to keep your child engaged and interested. If your child expresses a great interest in art, then it might be worth enrolling them in an arts or crafts class. This will help them build on their skills and make new friends. Broaden their interest by engaging them in all sorts of art forms. Encourage them to read literature, take them to dance productions, or get them music lessons. It’s not just these things either. Point out sculptures in parks and discuss them. Look at street graffiti to show them that art takes many forms. There is so much art around us in so many shapes they can appreciate. If it’s possible or applicable, then remind your child’s school about how important art is for kids. From the benefits we have seen, and the statistics, it’s an important part of a kid’s education (source). Quick and easy art and craft projects might encourage both parents and kids to participate more. We all live busy lives and sometimes finding the time for these enjoyable activities, particularly after a hard day at work or school, can be taxing. Maybe you could set aside one night a week when the whole family steers clear of screen-time (source). Large projects can take time and effort, so sometimes striving for something simple and achievable quickly could be the way to go, especially at first. Place emphasis on the quality bonding time you get as a parent, as well as the creative time your kids get. It could be something as simple as folding a newspaper and making some cutouts then opening it up to see what they’ve created. Or they could build their own town, piece by piece, using toilet paper roll holders as the houses, decorating each one and popping a paper roof on (source). The larger the project, the more chance there is your kids may become disengaged as they don’t see quick results. I know a mom who enjoys quilting using crochet, and she lets the kids help, but they create one square at a time. This way they see their contribution to the overall finished product, but don’t give up halfway and become discouraged. 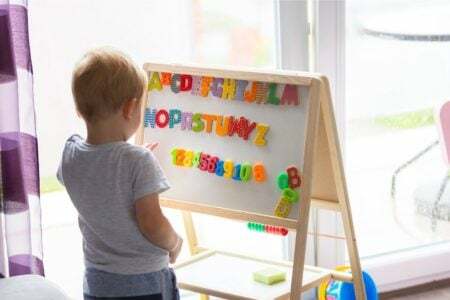 Let’s have a look at some ideas that might inspire you to get creative with your kids at home. This is a fun way to introduce babies and toddlers to art. They can explore the feel of paint as it oozes between their little fingers, or see the effect it has when they spread it around. Sounds impossible? This is suitable for babies and toddlers from the time they can lie on their tummy and lift their head and arms. I like that this introduces babies to paint without the clear up afterward. This project is more suitable for kids over 3 years old. It involves using small items, which a younger child might put in their mouth. Older kids will be able to do this with little supervision, but a younger child may need help. I like that this is an activity that kids of different ages will enjoy. Googly eyes (of the sticky-back variety). Okay, now it’s time to get messy. There’s little you can do to avoid it when introducing a toddler to finger painting, but they will have so much fun. Just make sure you use washable paints and maybe have the bath ready once they’re finished. It’s great there are no specific instructions for this activity. Once you’re set up, let your little ones play and experiment with color. Paper, which can be any size, but think about where the kids are painting. You might want to make sure it’s large enough to cover the area. Plastic, or a sheet to cover the floor or table. Painting clothes. You could even leave your toddler in just a diaper if it’s warm enough. Paper plate or something similar, to put the paint on. A collage involves sticking things onto a backing sheet of paper or fabric. It could be photographs, pieces of cut-out paper, or bits of string, to name a few. Here are some fun projects that kids can do to create a collage. Fall is a great time of year — the heat of summer is passing and winter is on its way. Why not go for a walk and collect some colorful leaves to create a collage? This is a great way to get kids in touch with nature and be active, as well as being creative. A selection of leaves of different sizes, shapes, and colors. Optional googly eyes or marker pens. This project is great for kids aged 3 or over. Kids all have different ideas about what to do with various materials and shapes. I like that this project can teach a child about shapes at the same time as making artwork. This could be done by preschool kids, with some assistance from you applying the glue. A selection of shapes, pre-cut from different materials, such as tissue paper, brown paper, fabric, or foam. Suitable for preschoolers, this project involves the use of color, scissors, and following lines. It’s ideal for helping a child recognize colors and get them acquainted with using scissors. That helps with promoting fine motor skills. A selection of different paper in rainbow colors. Patterned, glitter, or textured paper. You could recycle this from magazines, old Christmas or birthday cards, or wrapping paper. PVA glue, safe for kids. Printer (optional). There is a template of a rainbow supplied for this project for you to print, or you can draw one yourself. Once your kids can hold a pencil or crayon, they’ll love to draw. Starting out, it will just be some scribbles on paper, but as they get older, their creations will become more recognizable. This is great for you to get involved alongside your kids. You don’t have to be good at art and neither do they, but drawing together gives you valuable bonding time. It’s suitable for kids who can hold a crayon or pencil. A selection of colored markers, pencils, or crayons. Getting your kids to trace around shadows is a great idea to help them learn about shadows and how they change. This is a fun outdoor activity on a sunny day for kids of school age. I like that it will help teach kids to trace an outline and be more precise. Any toy animals, figurines, dolls, or other objects that will cast a shadow. Poster putty (to hold the paper or figures down if it’s windy). A table or flat surface. Drawing people and faces can be a daunting task for kids. This is a great way to get them practicing. They can draw each other or it’s something mom or dad could do with a child, and is suitable for kids over the age of 4. This is so simple, just hold up the sheet protector to your subject’s face, look through it and draw them. Painting can be simple and fun. It can transform a plain piece of paper or a household item, like an egg carton, into a work of art. It will hone your child’s fine motor skills and their hand-eye coordination, too. This is a quick and easy painting project that allows children to experiment with color and mix them together. I like the results are seen quickly, which will stop kids from getting bored. It can be done by any child who can hold a paintbrush. Various colors of tempera paint. Painting doesn’t always have to involve brushes. I love the simplicity of this bubble painting technique and the unique pictures it creates. This is something that older kids could do on their own or younger ones with mom or dad’s help. With a ruler, pencil, and some paints, your child can create a colorful painting to hang on the wall. For younger kids, help might be needed, but older kids will be able to do this on their own. I like that this gives kids the freedom to choose the color, but also to be able to show patience and constraint staying in the lines. Small circular object (like a bottle top). A piece of cardboard and some painter’s tape. Art that can be done on a whim with items you have around the home saves you time and money. No waiting to go to the art store to get expensive supplies. Just throw together a few things you have on hand and let your kids create. I like that these cars can be made quickly and easily from things most of us have lying around the house. White foam or thick paper. This project could even be completed by preschoolers with a little help. This is so simple and effective. It takes minutes to set up and will keep your little ones amused for some time. This should be suitable for most kids who can hold a marker pen and draw some dots on paper. A sheet of kitchen towel. Got some yarn or embroidery thread left over from other projects? You can use this to let your kids create string art, and get them used to the basics of sewing at the same time. As this involves using a needle, it’s a better project for older kids. A thick sheet of paper, like cardstock. Pom poms and glue, if you’d like. You could make a string art dinosaur, butterfly, car, truck, or whatever strikes your kid’s fancy. The principle of creating the holes and then randomly feeding the thread through remains the same. Arts and crafts benefit our kids in so many ways. Whether it’s painting, drawing, sewing, music, dance, theater or any of the other arts, they all contribute to our children’s well-being. It helps them develop and learn to express themselves in different ways. It’s important, as parents, we make sure that our children have access to the arts, both in and out of school. You never know, it might be the path to a career later in life. Even if it isn’t, it will ensure our kids grow up well-rounded. We hope you enjoyed our guide to the benefits of art for kids and found it informative. Please leave us a comment, we would love to hear from you, and don’t forget to share.